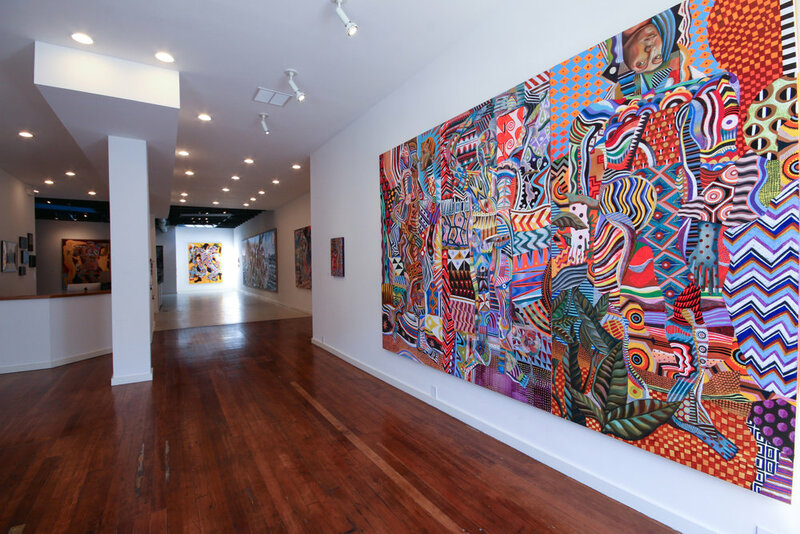 Jules Maeght, of the Fondation Maeght and Galerie Maeght, Paris, opens his second gallery show in the new Hayes Valley, San Francisco gallery entitled Painting is the Pattern from March 6 - April 30, 2014. 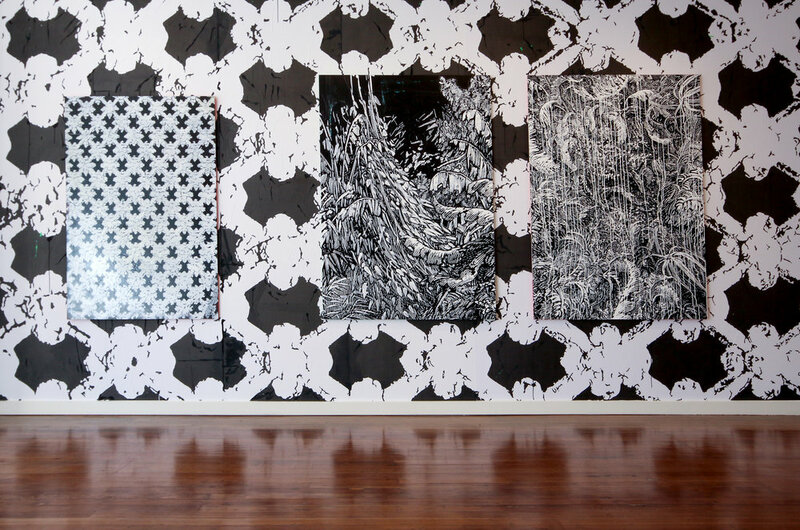 This exhibition features commissioned new work by two emerging young artists. Pierre Roy-Camille from Paris and Zio Ziegler from San Francisco are known for their energetic and studied relationship to canvas and paint and for their street art and interface in the worlds of fashion and technology. Roy-Camille and Ziegler both engage in studio and street practices and create bold paintings and murals with distinct signature styles. 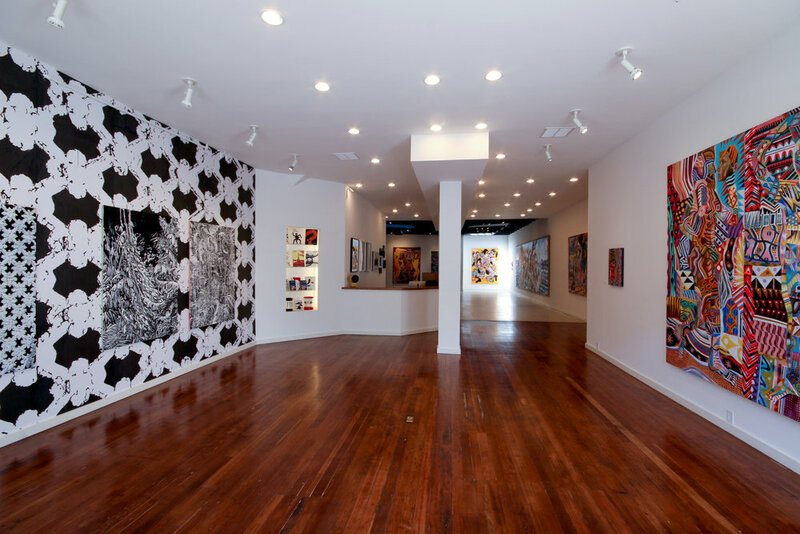 Jules Maeght Gallery brings these artists together for the rst time in a show that will transform the gallery space with a dramatic and dynamic exhibition design, murals, wall drawings and site-speci c paintings. The work of Paris-based Pierre Roy-Camille responds to the Hip-Hop, Rap and graf ti of his generation, on im- provisation, sampling and collage. Roy-Camille is in uenced by nineteenth century illustrator-printmakers such as Gustave Doré and aligns himself with contemporary artists such as Christopher Wool and Ed Ruscha. Roy-Camille subject matter is the natural world which he interprets onto multiple surfaces such as walls, wood and canvas in order to evoke his own experience. Pierre Roy-Camille de nes himself as a “producer of images,” concerning himself more with the nal image itself than speci c process, medium or technique. Pierre Roy-Camille utilizes a wide array of media, from mural painting, to etching to screen- printing, often exclu- sively in black and white, to create powerful imagery. He creates a system of motifs, both natural and personal, between dream and mirage that are repeated throughout his work. “Working on different surfaces in different media such as wall-paper, fabric, windows, ten meter walls, forces me to adapt my skills all the while remai- ning coherent and true to the story I wish to tell. I love this kind of exibility and acrobatics.” For the Jules Maeght exhibition, Pierre Roy-Camille will be creating site-speci c work that will include painting on the gallery storefront window. 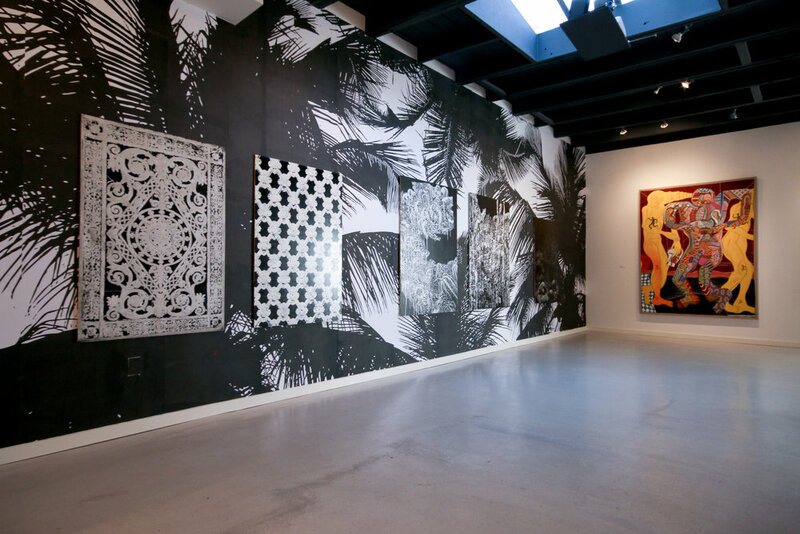 Bay-Area native Zio Ziegler, is motivated and driven by a comprehensive knowledge of art history and philoso- phy, a sensitivity to the pervasiveness of technology and the ubiquity of image making. With his unstoppable zeal to create, Zio Ziegler makes immersive work on multiple surfaces that is de ned by a distinct palette of colors and recurring tribal and modernist motifs reminiscent of Picasso and Leger. 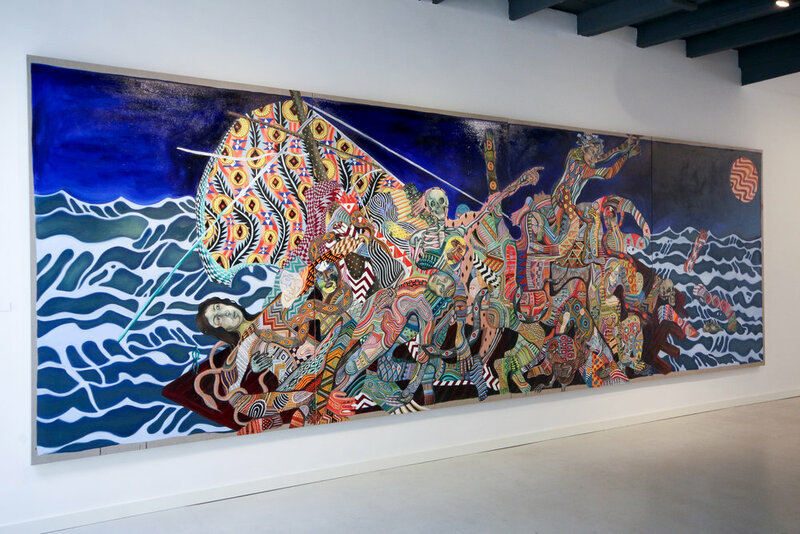 Zeigler’s paintings and murals capture the velocity of the world around him as well as his global travels and experiences. His paintings and murals may suggest rich allegory and personal interpretations, but for Ziegler it is as important that his audience relates his or her own stories to the works, engaging in a dialogue with his painting, one where self-discovery can be as important as latent meaning.